Lifeboat radiotelegraph transmitter receiver (LRTTR) was used as a last resort safe guard. When a vessel sinks communication may be hard to make aboard. When survivors would get to the lifeboat this device would be the relay for them to be saved. It is designed to float so even without the lifeboat, this could be found floating about to maintain a connection. Many are a bright orange to help create a contrast so a passing by ship or even aircraft could spot it. This is by far one of the coolest communication devices we have on display! 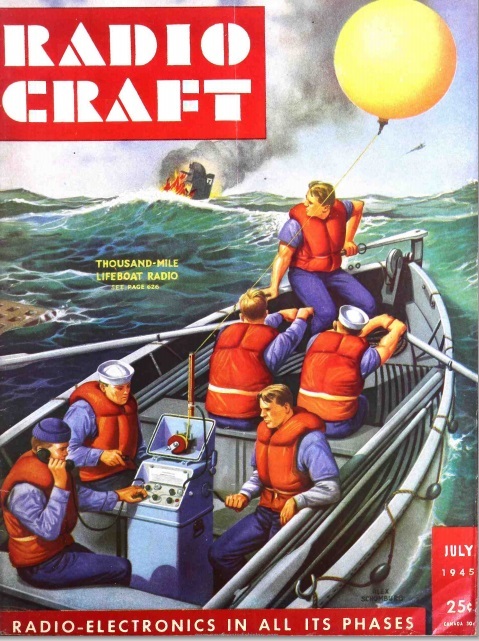 Lifeboats are always seen as a way to just get to shore and possibly stay dry. Using this device would make navigating much simpler in the sense of the connection can be stronger if you are closer to shore or another vessel. To use the LRTTR a ground wire would be placed in the water while the antenna is raised. This device runs by hand crank to send and receive messages. Morse code is the only source of communications on this device. It has built in key and headset to hear the sounds as they transmit. It can also send an automatic distress signal to all receivers in automatic mode. As communication in the world developed each piece of equipment made had a strong purpose and live out its lifespan. Morse code had been the biggest development in communications for seafarers. The integration of morse code on devices such as this would only make it much more seafarer and easier to be found. We currently have a Radiomarine Corporation of America – Model: ET-8053 LRTTR on display. Come on down and take a first up close and personal look! Contact us! Tweet us at @mmncny and like our Facebook page! Visit our Tumblr for our Maritime Navigation spotlight blogs! In 1836, Samuel Morse and others founded this way of communication using dots and dashes as a quick way to get a message across. The signal strength never mattered too much because it would use so little strength to get the message across. As along as the person receiving it could understand the message things usually went smoothly. As voice transmission made its way into control, Morse code became a background player. It was the alternative way to send a message if the voice transmitters had not enough signal strength or were just not functional. Soon after the rise of Morse code it had been incorporated into a lot of ship equipment. Many of the communication receivers we have here at, the Museum of Maritime navigation and communication, were used to pick up these signals. 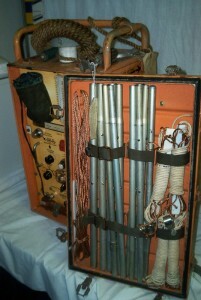 The early distress equipment such as the EPIRB (Emergency Position Indicating Radio Beacon) and the Lifeboat Radiotelegraph Transmitter- receiver, functioned with Morse code as a center point. Morse code was a universal and easy way to transmit distress and problems aboard ships. These devices would transmit on frequencies both on land and in the sky. Pilots would be able to hear forms of distress if in the vicinity of a sinking vessel or a vessel in trouble. Most pilots and air traffic controllers had basic understandings of the system, enough to ensure the action needed when distress echoed on the frequencies. Many radio repeaters can identify with Morse code even though voice communications dominate the skies. Morse code has since decreased in popularity since the start of the 21stcentury it is still a very interesting form of communication. Schedule a tour with us and even get hands on experience with our Morse code exhibit. Visit our website at mmncny.org, tweet us at @mmncny or even check out the current Morse code exhibit we have ongoing now at the Staten Island Children’s Museum.